Samsung Electronics today introduced the world’s first 8K AI technology for its new 85-inch 8K QLED TV at its product unveiling of The Wall ahead of CES 2018. 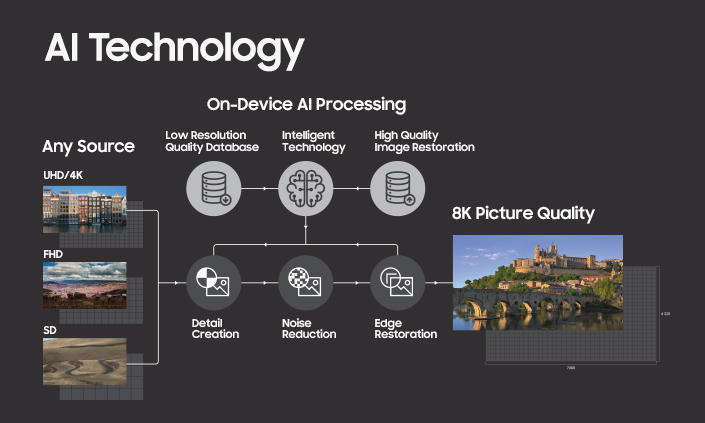 The AI technology based on machine learning analyzes content and automatically upscales low-resolution images into 8K picture quality. Despite the fact that the market is currently flooded with an ever-increasing number of displays capable of realizing super-high resolution such as UHD and 8K, many viewers are not able to fully enjoy the experience due to the lack of available high resolution content. 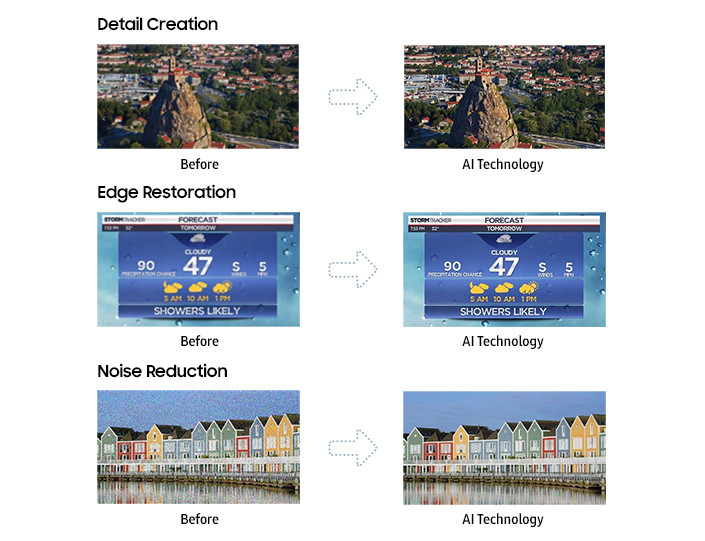 However, Samsung’s AI technology has all but eliminated this obstacle by enabling the television to transform all pictures into 8K, the current highest ultra-high definition television resolution in digital television and digital cinematography. It lets consumers enjoy just about any movie or TV show on any channel in 8K resolution regardless of native resolution or method of transmission. First, QLED TV, based on AI technology, is equipped with a database that studies and analyzes millions of images in advance to transform low-resolution content into high-resolution. When fed with a source in low resolution, this feature of the QLED TV selects the optimal filter and converts the source into a high-quality image. In addition, by increasing image processing 64 times, the technology helps offer natural images in high-resolution, without compromising gradation in the picture. In the image of an aurora, for instance, the TV provides consumers with subtle, seamless gradation. Lastly, the new QLED TV categorizes elements of picture quality (black/blooming/brightness) in input sources by scene to produce pictures with richer and more detailed contrast. With the feature, the edges of text are rendered sharp and a moonlight image is offered with the edges of the moon in the background clear, not blurred. Furthermore, Samsung’s AI technology enables the TV’s sound to be optimized for specific scenes, without having to change any settings. If you’re watching a football game, for instance, the cheering of the spectators is amplified to recreate the excitement of the match. Or, if viewing a concert, the low-frequency sounds of the music might be highlighted to deliver a richer sound. This AI technology has already attracted much attention, landing Samsung’s 2018 QLED TV lineup a CES 2018 Innovation Award, honoring outstanding design and engineering in consumer technology products. Samsung 8K QLED TVs with AI technology will be launched during the second half of 2018, focusing on sets with screens larger than 65 inches. By rolling out this technology, Samsung is improving the viewing experience for the consumer by making it possible for them to easily enjoy all of their favorite video content in a sharper, richer and more pristine image quality.